The content of intramuscular fat (IMF%) in lamb is an important trait for the lamb-meat value chain. Not only is IMF% an import-ant energy reserve for replacement stock, IMF% is an important driver of lamb-meat eating quality. A growing body of research shows an antagonistic relationship between muscle growth traits and fat content across the lamb carcass (including IMF%). The New Zealand sheep industry has selected for muscle growth traits for decades to improve production efficiency and reduce extremes of carcass fatness historically observed, but the impacts on IMF% levels in New Zealand lamb have not been widely investigated. 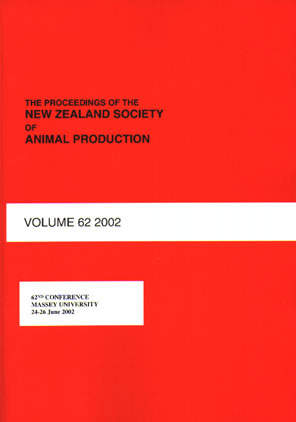 This paper aims to stimulate discussion on lamb IMF% by reporting on levels of IMF% observed in the M. longissimus lumborum (LL) of 1,705 progeny test lambs raised under extensive, pasture-based production systems across New Zealand, and investigates the relationship between IMF% and carcass weight, VIAscan®-predicted GR (VSGR) and lean-meat-yield percentage (VSYLD). The average IMF% was 2.69%, (SD = 0.83%, and ranged between 0.91-6.42%). IMF% is positively correlated with carcass weight and VSGR and negatively correlated with VSYLD. Considerable variation exists in lamb IMF%, highlighting the opportunity to manage IMF% through genetic improvement and optimised on-farm management.